I was just informed that the rest of the world doesn’t know what kitten season is; and that, dear reader, is flipping tragic. How do you live without the knowledge that in the spring there will come a time of such joy (finding kittens) and pain (getting clawed up by momma)? Seriously, handfuls of kittens. Is there anything cuter? It is one furry, warm, mewing ball of awesome. Well, except for the momma. 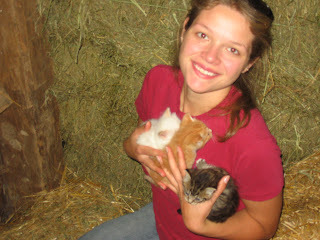 If she is tame it’s cool, but the half feral barn cats don’t take so kindly to interlopers. For some reason tricking them into leading you to their kitten nest really makes them mad. That is an armful of cuddly goodness right there.